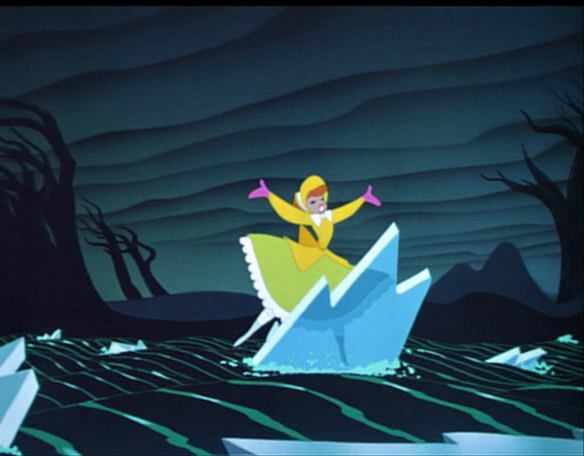 Once Upon a Winter Time’ is the first and easily the best sequence from ‘Melody Time‘. In this film, sung by Frances Langford, we follow a young romantic couple on a sleigh ride. They go skating and are joined by an equally romantic couple of rabbits. After a short break-up the two females are caught in drifting ice and heading for a waterfall. Surprisingly, they are rescued by the couple’s two horses, who get help from a pair of birds and a pair of squirrels. They return the ladies in distress to their male counterparts, restoring love. This sweet story is particularly interesting for its highly stylized backgrounds based on designs by Mary Blair and featuring unnatural colors, like a yellow sky. The story looks back to ‘On Ice‘ (1935) and even ‘The Ugly Duckling‘ (1931), which both feature a rescue from a waterfall, too.